Please note that the NG Scripter is required to produce working DAT files for the new game engine. 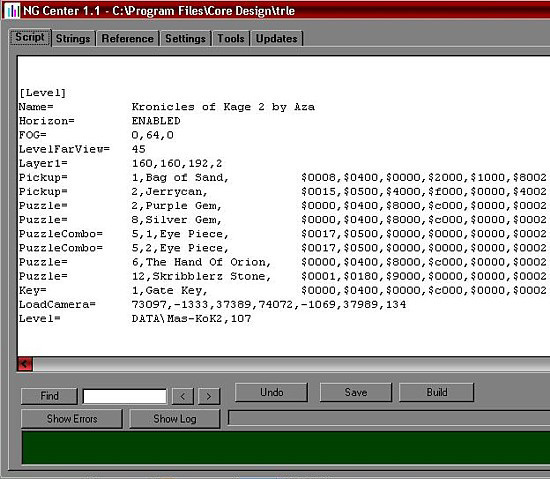 If you convert your scripts manually, new features will not work in the new game engine. 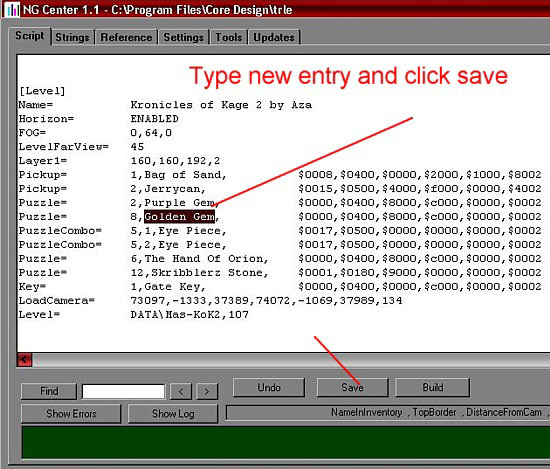 You will find the NG Center installed on C Drive - Programme Files - NG Center. First start up the NG Scripter which will automatically load in the information from the script and english txt files in your trle script folder. 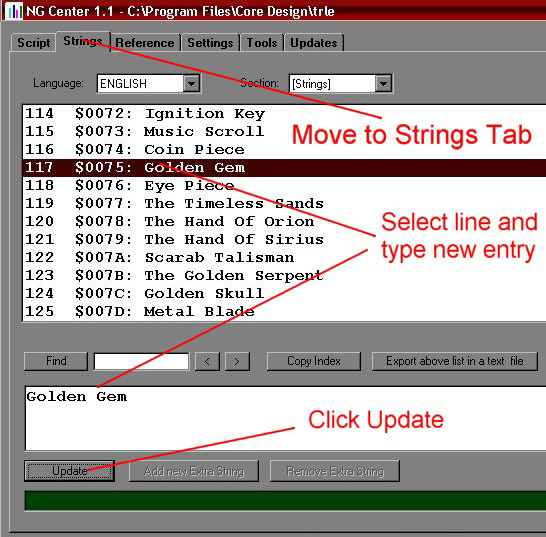 To make changes to your script, overtype any existing entries and click Save. Now move to the Strings tab and scroll down until you highlight the entry you wish to change. Type your new entry in the box as indicated and then click the update button. 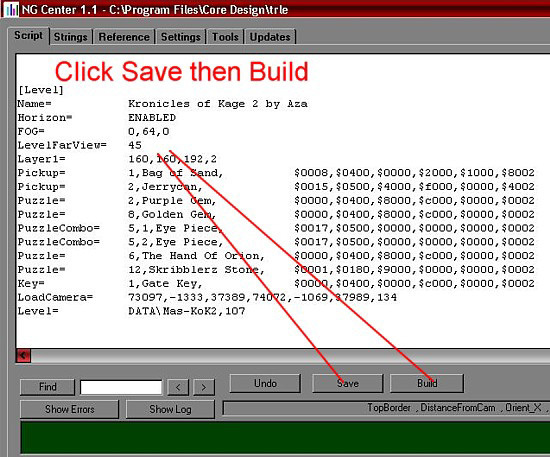 Once you're happy with your changes, go back to the Script tab, click save and then click Build. This will produce new DAT files in your TRLE main folder. 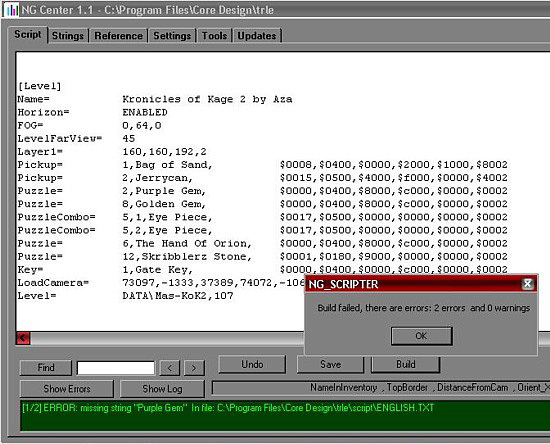 If you make any typos or forget to do something important, an error message will display how many errors there are, and for your convenience the NG Scripter will even display what those errors are in the information bar at the bottom so you can easily rectify the problem. When you save and build a new script, error messages may appear at the bottom about language errors. Just delete all the script entries apart from English and you're on your way.